Are you still pinching yourself that summer is ACTUALLY here? After the winter here in the Northeast, I feared I would never see a blade of grass again, let alone see sand at a beach! Yet, it is here and the warm weather is very welcome in our house. So we are already planning for our first beach trip! 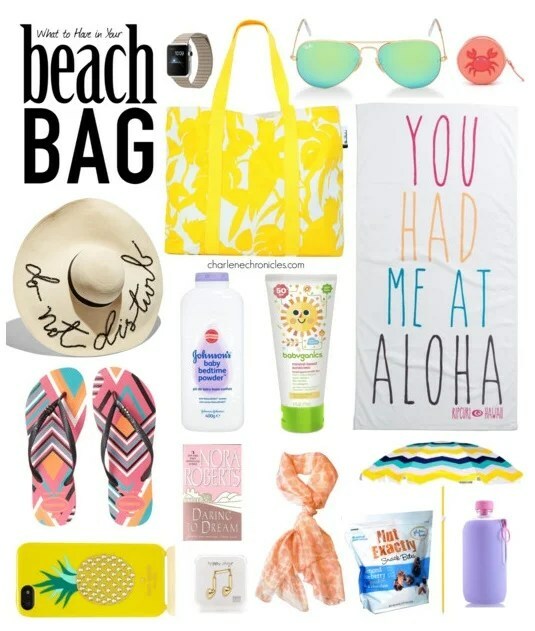 So if you are headed to the beach soon, here are some must haves for your beach bag! First, a towel, beach umbrella and a hat are musts to have a place to sit and a way to keep cool. Add the uber popular mirrored sunglasses that are the rage this summer season, and you have got the basics. Add essentials like water, sunscreen, and flip flops, but don’t forget the baby powder, which can help prevent your swimsuit from ridding up and/or riding down. Plus, sprinkling it on wet, sandy feet and legs ensures that the sand wipes right off. Then the other items will make your beach foray that much more fabulous. Add a scarf that can double as a sarong, or drape over your shoulders for lightweight sun protection. Bring your phone and headphones for music listening, a book and snacks. I’m a huge fan of Fisher Nut Exactly Snacks. The new Almond Blueburry dipped in Dark Chocolate at Costco is a combo of blueberries, pumpkin seeds, whole grain popcorn in a bite sized snack, dipped in yummy chocolate. It’s scrumptious, gluten free, and smart snacking in the sand. For the piece de resistance, bring a new Apple Watch with you too. It will enable you to keep track of how long you have been in the sun, when to come back to reality and keep abreast of emails (in case you told your boss you were working from home.) Lastly, pick up a cute coin purse. Leave your wallet tucked away safely in your locked car, and just carry around some change for those popsicles. When picking up these pieces, have fun with it. Go bold, go quirky, go beachy. Pick bright colors, tropical themed items, and trendy pieces. Because summer is short and should be splendid! What are your beach bag essentials? Leave your tip below, or follow me on social media (which I would really appreciate…no, really!) and enter to win a 20 ounce bag of Fisher Nut Exactly Products and a $50 Costco Gift Card. (Don’t worry, if you are not a member, you can still use it!) Full giveaway rules can be found here. Your name and email address are only collected to contact you, and are not used or stored for any other purpose. I don’t play that way. Giveaway ends July 1, 2015 at 5pm ET. My beach bag essential will have water/gatorade/fluids. Depending on the regulations of the area we are going to (ie if they allow dogs), my bag will have “poopy bags” too (I always clean up after my dog). We love the mini boden and hanna andersson towel sweatshirts! My bag essentials would be cold water, a protein snack, and lip balm. A good book and high SPF sunscreen! I must always have sunglasses in my beach bag! My essential is sunscreen. I burn easy and this is a must have for me. Mine are sunscreen, sunglasses and hat! I live at the beach and like to grab a light bag when I head out to the sand. Gotta have a book and lip balm – sunglasses, too, but they’re already on my head. My must have would be my iPhone so i can surf the web & listen to music! Sunglasses and headphones are essential for the beach! My beach bag must have is an excuse. I kinda hate going to the beach and will say anything to get out of it! I would have water, snacks, and sunscreen in my beach bag. I’m pretty low maintenance. I just need sunglasses, sunscreen, lip balm, and water! In my opinion the most essential is sunscreen. My beach bag essentials are water, sunscreen, lip protection and a good book. My beach bag essential is a bucket with shovels for the kids to play with. My beach bag essentials, sunglasses, a huge towel, chapstick, sunblock, bottled water (usually freeze it the night before) something to tie back my hair, a good book and a hat. Usually bring a coverall as well in case I want to walk around on the pier or go into a store or restaurant later on. Sunscreen, Towel, Toys and a book!